This small image represents an aspect of Yama, the Hindu god of death who was also integrated into the Buddhist pantheon. Here he acts as a dikapala, one of the ten guardians of the directions of cosmic space: Yama is responsible for the southern direction. His body has very harmonious proportions: graceful and slightly plump, he is the Nepalese ideal of a vigorous young man. His coiffure is retained by a band, giving the appearance of a flat hat. The high copper content in the alloy, so esteemed by Nepalese sculptors, has made his facial features very soft and now quite abraded. Even so, the wide eyes of his squarish face glance downwards in a placid expression. His very large cylindrical disc earrings are typical of Nepalese jewellery of the tenth to twelfth century . In place of other jewellery, he is adorned with snakes coiled around his neck and limbs as a necklace, bracelets, and anklets, and a snake forms the sacred thread across his chest. His proper right hand, now empty, has an aperture indicating that a separately cast attribute or weapon was originally held; the clenched left hand also has an aperture suggesting that it held an attribute. Iconographic textual descriptions indicate that Yama would have held a staff or a vajra in the right hand, while the left could have held either a hook or a cord . A shawl or sash draped at his lower back hangs over his forearms at the front, and he wears a knee-length dhoti with alternating broad and narrow horizontal stripes. 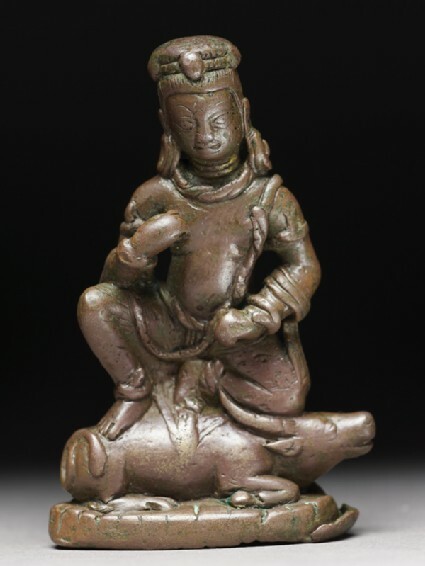 Yama is seated resting his weight on his flexed left foot, the knee pressed to the head of the water buffalo, his vahana or vehicle. His right knee is raised, the foot placed flat on the animal’s haunch. He is perched as if ready to rise from his position on the buffalo, conveying a dynamic sense of potential action. His body, the buffalo, and the supporting lotus are all cast together. The lotus is modelled in the form of a low oval base, a type often found in Nepalese sculptures of the ninth to eleventh century . 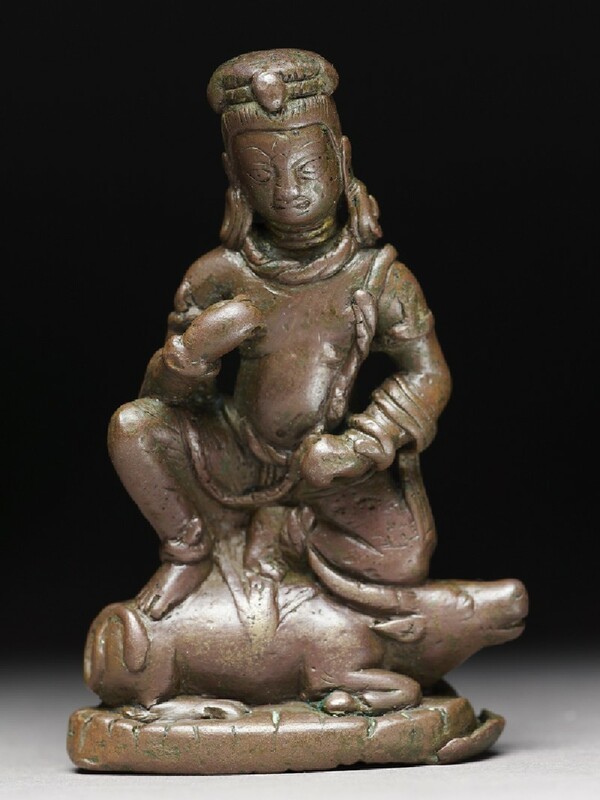 1 See Pal, Art of Nepal, nos. S12, S24, S26. 2 de Mallmann, Introduction à l’Iconographie du Tantrisme Bouddhique, p. 462. 3 Pal, op. cit., nos. S7, S18.